France’s all-time leading scorer and Arsenal great Thierry Henry landed his first managerial job on Saturday after Monaco hired him as a replacement for Leonardo Jardim, who was dismissed last week. The 41-year-old Henry started his professional career at the Riviera club and played in the French league with Monaco from 1994 to 1999. 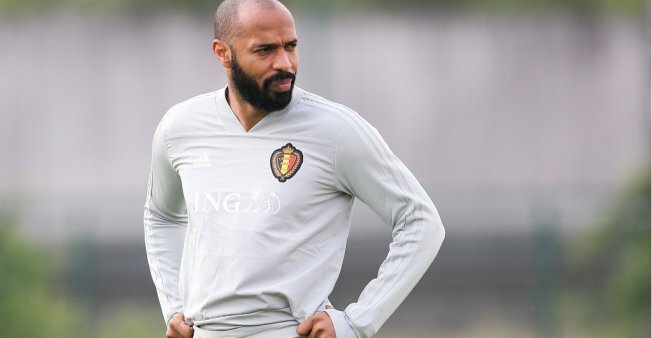 Henry has no experience as a manager but has been working as an assistant to Belgium coach Roberto Martinez since 2016 and helped lead the team to third place at the World Cup in Russia. Henry becomes the latest member of the French squad that won the 1998 World Cup to embrace a coaching career, following Laurent Blanc, Didier Deschamps, Patrick Vieira and Zinedine Zidane, among others. “Thierry’s ready,” France manager Deschamps told French TV news network TF1. “He has everything” to be a good coach. “He’s throwing himself into an exciting, exhilarating project where he’ll have to take responsibility. It’ll be up to him to take the reins,” Deschamps added. Henry turned down an offer from Bordeaux this summer and was in the running at Aston Villa. At Monaco, which is winless in its past 10 games in all competitions, Henry’s first task will be to get the team back in contention in the league. A traditional powerhouse in French football, Monaco secured top-three finishes over the past five seasons and won the 2017 league – under Jardim – but is currently in 18th place in the standings and in last place in its Champions League group. Henry’s first-class career was launched in 1994 by Monaco coach Arsene Wenger, who five years later brought him to Arsenal. Wenger promoted Henry to Monaco’s first team after the fast and technically gifted forward scored more than 30 goals with the under-17s in one year. Aged 17, Henry played his first French league game in August 1994. He ended up playing 141 matches in all competitions with Monaco, winning the 1997 league. At Arsenal, he joined the pantheon of modern greats. He scored at least 20 league goals in six consecutive seasons and became Arsenal’s all-time leading goalscorer. He won seven trophies with the Gunners, among them two Premier Leagues including the unbeaten 2003-2004 side. Henry ended his 20-year playing career four years ago after claiming multiple trophies, including the Champions League and the World Cup. After he retired, he worked as a TV analyst and quit his role as a UK Sky Sports pundit in July to focus on his ambition to become a manager. Henry holds the French record of 51 goals in 123 internationals. He won the 2000 European Championship but finished on a low: In 2009 came the infamous handball in the decisive goal against Ireland in a World Cup playoff. At the World Cup in South Africa, France didn’t win a game and caused a scandal by refusing to train before their final match. Coach Raymond Domenech arguably played his part in the debacle by dropping the hugely influential Henry from the starting lineup and souring a fragile atmosphere within the squad. It was a sad and humiliating end to Henry’s international career when he made his final appearance as a second-half substitute, with his shell-shocked side trailing South Africa 2-0 and headed for the exit.